Thirteen-year-old Chloe Turner wants nothing more than to follow in Dad’s footsteps as a respected concierge in a posh NYC hotel. After all, living at a hotel is heaven, and perks like free concert tickets and all-access passes to boutiques, restaurants, and attractions aren’t too shabby either. When the spoiled brat child of an important guest is only placated by some quick thinking on Chloe’s part, Chloe is awarded the role of Junior Concierge. But she might be in over her head when tasked with tending to the every whim of three royal guests: a twelve-year-old princess who can’t stand Chloe, a cute fourteen year-old prince(! ), and their ten-year-old sister, who has a nasty knack for getting herself lost. After the youngest princess slips Chloe’s care, Chloe and the remaining royals must embark on an event-filled hunt for her through NYC’s best tourist spots. Hope you guys enjoy the interview! 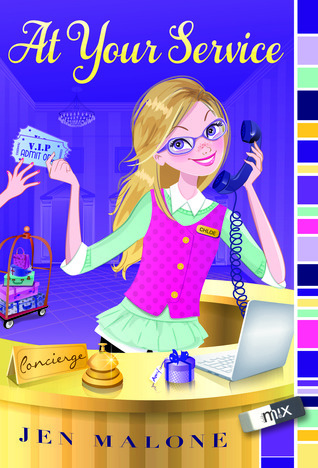 Answer: Romp through NYC sites when tween concierge loses visiting princess. Question: Where did you get the idea for At Your Service? Answer: I have to give my editor, Annie Berger, most of the credit here because the overall concept of “girl lives and works alongside her concierge dad at a fancy NYC hotel and one day she loses a young royal visitor in the middle of the city” was hers and the publisher requested fifty-page submissions from a handful of authors. I was lucky enough to be picked to write the rest and from that point I had complete freedom in where to take the story. In fact, I remember on my first call with my editor, I said, “Okay, what comes next” and she said,” How should I know? !” with a smile in her voice, which was perfect. It was like a souped-up version of a really great writing prompt exercise! Answer: The scene is still in there but it got tweaked a lot! And I can’t even say I regret the changes because it works much better with the overall tone of the book now, but I did have a lot of fun writing the first version. Anyway, I had this very over-the-top subway rescue scene where Chloe, my main character, gets her foot caught in the gap between the subway and the subway platform as the train is about to pull away. The missing princess’ brother, who happens to be a super-cute fourteen-year-old prince, rushes in to save the day and, when it turns out her ankle is hurt, carries her in his arms up the steps and out of the station. Swoon! First, my Brooklyn-based beta reader weighed in to say the gaps between train and platform are way too tiny for even a kid’s foot to get stuck, so I had to switch it to her purse strap getting stuck in the closing doors. Next, my editor was concerned the carrying-in-the-arms thing might be a bit much, so that got changed to a piggyback ride. The scene has a lot more humor than drama now, and works better for the story, but I liked the image of her being carried off by the prince into the…well, swap out “sunset” for “bowels of a city”! Answer: I really wanted to capitalize on the fantasy of living in a high-end hotel as a tween (room service at your sleepovers!) but I wrestled with getting to the crux of the story where the princess goes missing quickly and, as she’s at large in NYC, none of the search that followed would take place in the hotel. I was psyched when my editor felt we could add in more at the hotel without slowing the pace too much. Chloe has free reign there and is “adopted” by a lot of the staffers. One of my favorite scenes is when she, in her own unique fashion, helps her favorite housekeeping employee take all the Pepsi cans out of the hotel minibars and replace them with Coke cans all because they have Coke executives staying at the hotel. It’s representative of the type of insider dish on hotel life (and NYC) that I sprinkle throughout and I had SO much fun writing those tidbits! Answer: Wow. So, so many weird ones. The strangest recently was “images of death certificates issued by US Embassy for individuals traveling abroad.” Yesterday I Googled “Camping out to see Five Seconds of Summer perform” because I’m looking for someone to interview for my WIP. Question: At Your Service is your debut Middle Grade novel. How does it feel knowing your book will be in the hands of readers in just under a month? Answer: Very, very strange and also exhilarating! I’ve had some tweens read advance copies and their little notes to me are beyond awesome. There is no filter on middle schoolers and I love that. When they’re enthusiastic about something, they are drawing rainbows and unicorns everywhere! When they don’t like something, they’re more like, “Nope. Just nope.” Fortunately, feedback has been positive so far! Question: You have three middle grade novels coming out with Simon & Schuster/Aladdin M!X between now and Fall 2015, plus two young adult novels coming out from HarperTeen in 2016 and 2017. How are you juggling five novels all at once? Are they all at different stages in the publishing process? Answer: The short answer is, “Oh god, I do not know how I’ll do it! !” But the saving grace is that my next MG series is co-written with the very talented Gail Nall, who has her MG debut, BREAKING THE ICE early next year, and we’ve been able to pick up the slack for each other when our other deadlines or promo stuff intrudes on writing time. I also tend to be, um, obsessive, about my passions so I really don’t mind “working” all the time! Yes, they’re all at different stages. At Your Service is done, obviously; we just turned in revisions on book #1 of RSVP so that will get line edits and head to copyedits soon; and we’re plotting book #2 now with plans to write it this fall. My first YA is awaiting an edit letter and the second is scheduled for 2017 and that’s so far in the future that I’m just pretending it doesn’t exist, even though I know it will creep up on me fast! Question: What’s it like writing both MG and YA? How is writing for the MG age group different than writing for the YA age group? Answer: I think middle grade is more about kids figuring out where they fit into their groups (at school, within circles of friends) whereas young adult is more about teens finding out where they fit into the world. There’s a broadening of horizons as life after school becomes more of a tangible than a far-away thought. You didn’t ask how the two are similar, but I’m going to answer that anyway because I think, no matter the age, that no one wants to be preached to or talked down to. Often, the tendency is to see kids as a group that needs that guidance from an adult/author. Kids are savvy enough to call BS on this every single time. I read an interview recently with a lit agent who said, “MG writers can’t write to kids, they need to write AS kids,” and it really resonated! Answer: Just one. Have laptop, will write! Answer: Of my most recent reads, I really loved Rebecca Behran’s WHEN AUDREY MET ALICE, and Rainbow Rowell’s LANDLINE. Can’t wait for Alison Cherry’s FOR REAL (which comes out later this year). For 2015, I have to say my co-writer Gail Nall’s BREAKING THE ICE is adorable and I really enjoyed Lori Goldstein’s BECOMING JINN. Question: Of the five novels you have coming out, which one are you currently working the most on? Can you give us any hints or details on any of your upcoming novels? Answer: This is going to sound crazy weird, but… none. At the moment I’m waiting on an edit letter for my YA and also waiting for my co-writer to come back from vacation to start drafting book 2 of RSVP, so I’m filling the down time by researching/plotting a “side project”, which is a MG about two teens who meet while camping out to see their favorite boy band perform on a morning show and after they return home, form an endearing long-distance friendship through exchanging fangirl vlogs about the band. Boy band crushes are such a huge part of many tweens lives and I haven’t seen a ton of books focusing on them. So far, the research has been a bit scary, a lot loud, and mostly incredibly fun! 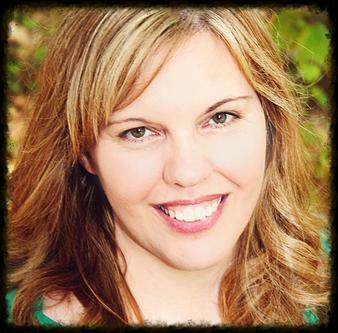 Jen Malone is a middle grade and young adult author. 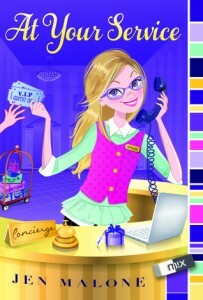 Her debut AT YOUR SERVICE publishes with Simon & Schuster/Aladdin MIX in August 2014 and her new series, RSVP (Simon & Schuster), co-written with Gail Nall, launches with Book #1 in 2015. Her YA debut WANDERLOST publishes with HarperCollins in 2016. Jen lives north of Boston with her husband and three children and teaches at Boston University. Thanks to Jen, we have ONE eBook of At Your Service for giveaway! The room service, I love it!